Jobu Reviews the Yankees big series win in Detroit against the Tigers. I know I say all of these series are big for the Yankees, but the truth is they are. They’re trying to turn their season around after a sluggish start, so it’s important to win games. If the Yankees could win this series, it would give them six wins on their nine game road trip, which is a huge confidence builder for a team that really needed a boost. In the end, the Yankees should have swept the series, but we’ll take two out of three in Detroit any time. As a Yankees fan, I felt pretty good going into this game. 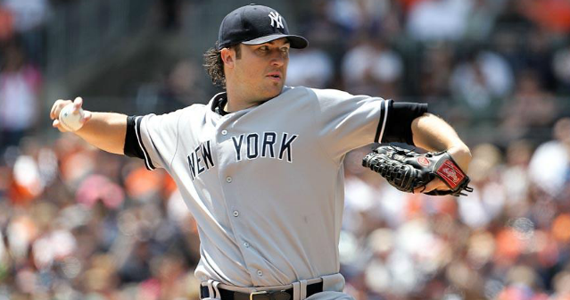 The Yankees had CC Sabathia on the mound against Casey Crosby, a lefty making his major league debut. While these types usually give the Yankees trouble, they beat up on the kid and got a big win. It was the second straight time the Yankees had pounded a pitcher making his major league debut (last week they beat up on the Royals’ Will Smith), which is almost unheard of. CC Continues to pitch poorly by his standards, although it is usually good enough for a quality start and a win anyway. I’m not sure what it is with him, he’s just off. He seems to be missing his pitches more (and usually to the worst hitters on the opposing team). In this game, he allowed a home run to Ramón Santiago, who might as well bring a garden hose to the plate if you’re basing his success on his ability to hit the long ball. Another guy that seemed to have CC’s number in this series (although as it turned out he didn’t limit himself to The Big Lefty™) was Quintin Berry. Berry tripled and doubled in his first two at bats, and was otherwise a real pest. At the end of the day though, CC’s line looked like this: 7 Ip, 8 H, 3 R, 2 BB, 5 K. It was enough to net CC his seventh win of the season, and we’ll take it, but he has yet to go out there and just shut a team down like we know he can. There’s always next week against Tampa, right? The Yankees had a bit of a watershed moment in the second inning of this game. Facing Crosby, they managed to load the bases and score a run with nothing but a little patience. Axl Rose would be so proud. Crosby walked Canó and Swisher to start the inning before Andruw Jones fouled out for the first out. Crosby then issued another free pass to Jayson Nix to load the bases for Chris Stewart. After Stewart flew out to shallow left (not scoring a run), it looked like the Yankees would leave the bases loaded again. Crosby must have felt bad for them, because he walked Derek Jeter to score a run. The next batter, Curtis Granderson, really gave Crosby something to cry about, snapping the Yankees 0-15 streak with the bases loaded by crushing a Granderslam™ to deep right. The Yankees led 5-1 despite only having one hit, and they wouldn’t look back. The other four runs were peppered throughout the game. Stewart singled in Nix in the fourth and Jones doubled in Swisher in the seventh before A-Rod gave the Yankees a lot of breathing room with his two-run home run in the top of the ninth to make things 9-4. Overall, the Yankees flexed some muscle, showed some patience and kept the pressure on throughout the game, and that’s how you win games. Frustration. That’s what this game was filled with for Yankees fans. The Yankees squandered countless opportunities to win this game, seemingly refusing to score runs, even when opposing pitchers were begging them to. In the end, the offense fell short and the Yankees lost the game in the bottom of the ninth, the second such game they would lose on this road trip. I also realized that it’s finally time to put John Sterling out to pasture in this game, as he raved for the entire ninth inning how this was the greatest game he’d ever seen played in his life. This was a ninth inning where two batters walked, two got hit by pitches and a catcher dropped a popup… The game was on FOX, so maybe he had on Yankees Classics on YES and was actually watching something else? Either way… Shady Pines, Ma. I can’t blame Hiroki Kuroda for this loss. I can’t even blame the combination of Phelps and Logan, who gave up the winning run. Kuroda really made one bad pitch all night, and it’s a pitch a lot of major league pitchers have made in the last ten years or so. He left a pitch out over the plate to Miguel Cabrera, who absolutely crushed it to dead center. I’m pretty sure this ball went over 450 feet. Bomb. The next inning, Kuroda gave up a single to (who else?) Quintin Berry, and the Tigers led 2-0. That was it off Hiroki. He pitched extremely well in this game, allowing only those two runs on seven hits, while walking one and striking out four. He was pulled with only 86 pitches, and Cory Wade gave up a home run to Cabrera of his own in the eighth, which led to some grumblings about Girardi, but the way Cabrera was hitting, he probably would have hit one off Cy Young in that inning. Bad luck seems to have followed Kuroda from Los Angeles to New York, as he continues to be one of the most poorly supported pitchers in the league. Are You Sure You Don’t Want to Win? The Tigers tried their best to give the Yankees this game. 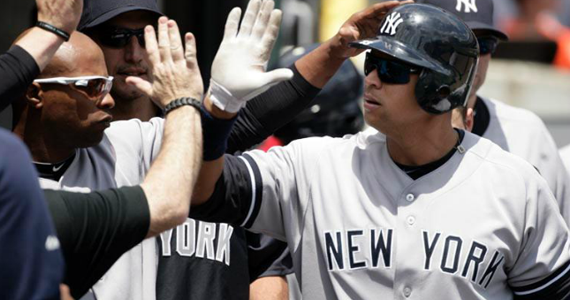 The Yankees had nine hits, four walks, two hit batsmen and one runner who reached on an error. Twelve of those fifteen base runners didn’t score. The Yankees got their runs on an RBI groundout by Ibañez in the sixth, an RBI single by Swisher in the seventh (a huge hit until Wade gave the Tigers the lead again in the eighth) and an RBI walk by Teixeira to tie the game in the ninth. It was in that ninth inning that the Yankees really showed that they had no interest in winning that game. José Valverde practically gift-wrapped the win for them, and they refused to do anything to help themselves out. Russell Martin started the inning by getting hit. After a pinch-running Dewayne Wise stole second, Jeter walked and Granderson flew out to center. The Yankees then pulled off a double steal, and A-Rod walked to load them up. Keep in mind that Valverde was about as wild as I’ve ever seen anyone be. He was nowhere near the zone with his pitches, and he was hitting people left and right. So, naturally, Canó popped up to shortstop. He couldn’t even get a weak grounder to score the run. Thankfully, Teixeira realized Valverde wasn’t throwing strikes, and ended up working the RBI walk. Ibañez then grounded out to end the inning and leave the bases loaded (again). 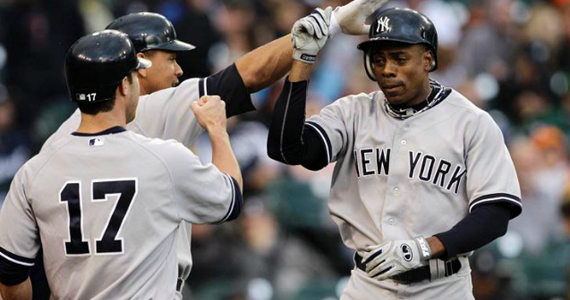 That would be all for the Yankees, as the Tigers promptly won it with a walk-off sacrifice fly in the next half inning. You never really feel good about having to face the reigning AL MVP and Cy Young Award winner (still ridiculous), but if any team should, it’s the Yankees. They seem to own the guy somehow, and nothing changed in this game. 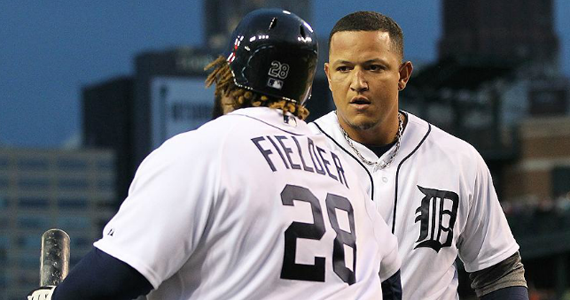 The Yankees jumped out to an early lead and Hughes held the Tigers down, which is a great recipe for success. After his last start in Anaheim, everyone was pretty down on Hughes. The four starts he had before that one, all very solid, seemed to be erased in our minds and replaced with his terrible first few starts and that Anaheim start. Phil told everyone to take a chill pill (I think that’s how they talk in California) and pitched the first nine inning complete game of his career. The only real blemish on Hughes came on an absolute bomb by Cecil’s son in the bottom of the fourth. Other than that, Hughes gave up only three singles, and Girardi rewarded his dominance by letting him finish things up himself in the ninth (even after he allowed a single to Delmon Young). It was a good gesture from Girardi, and a great confidence builder for Hughes. Good stuff. His final line: 9 Ip, 4 H, 1 R, 3 BB, 8 K, 124 pitches. Hughes evened up his record at 5-5 and lowered his ERA to 4.96, which is not bad considering how awful he was in the early going. I’m not sure why, but the Yankees always seem to give Verlander trouble. Very few other teams can boast this claim. The Yankees jumped on him early in this game. In fact, you can’t jump on a pitcher any earlier. Jeter took Verlander’s first pitch deep over the right field fence for a solo home run and a 1-0 lead. The Yankees added another run on a sac fly by Teixeira later in the inning, but it could have been worse if Canó hadn’t struck out with second and third and nobody out right before Tex. That’s pretty standard Yankees baseball though, so I can’t complain too much. The Yankees added a third run in the top of the third when A-Rod hit a Cabrera-esque bomb to right-center field. They estimated that it too went over 450 feet, hitting Hank Greenberg’s retired number when it landed over the bleachers. The last two runs came in the top of the fifth when Canó hit what I thought was a lazy fly ball to right-center. It somehow fell in (not sure what Boesch and Berry were doing out there), and Granderson scored on the triple. Canó on the play as well, because Miguel Cabrera forgot that the big brown leather thing on his hand is used to catch the baseball. He allowed the throw to third to get by him and into the dugout, and Canó was waived on home. That was it for the Yankees, but that’s all they needed.